How many mangoes can you consume when pregnant? What are the health benefits of eating mango during pregnancy? Are there any side effects of mango during pregnancy? How will you know if the mango is ripened naturally or artificially? 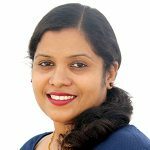 Is it safe to eat mango during third trimester? Come summer, and the king of fruits reigns the local markets! The luscious, juicy and delicious mango is a fruit that most people cannot resist. Pregnant women tend to crave them even more, owing to their sweet-sour taste. You could love the sour and tangy flavor of raw mangoes or the sweetness of ripe mangoes, but you might still have second thoughts about eating them when you are pregnant. So how safe is eating a mango during pregnancy? Can eating too many mangoes bad for you and your baby? Find the answers to these questions and more in this article about consuming mangoes during pregnancy. Yes, you can eat mangoes in pregnancy as they are an excellent source of energy, antioxidants and vital nutrients (1). But it is important to monitor the portions and avoid overindulgence. Mangoes are seasonal fruits and should be consumed at a time when they are naturally available. In any case, consult your doctor before including the fruit in your diet. It is best to consume no more than one mango a day. Also, include mangoes only if your doctor asks you to increase your calorie intake. A 100g serving of mango contains about 13.66 g sugar (2), which makes excessive mango consumption during pregnancy a bad idea. Besides sugar, mangoes have several other nutrients that make it a safe food for pregnant women. Mangoes also offer several benefits for pregnant women. Read on to know more about it. The following are the health benefits of consuming mangoes during pregnancy. Mangoes are rich in vitamin C and help in the absorption of iron, which an expecting mother needs to overcome pregnancy-related-anemia (3). Mango is a great source of folic acid which is essential for the development of the fetal brain and spinal cord. Mango consumption prevents the neural tube defects which can occur in early pregnancy (4). The fiber content in mangoes helps you feel full for a longer duration. Mangoes also aid digestion and prevent constipation that women experience in the first trimester (5). Vitamin C in mango acts as a powerful antioxidant that helps develop resistance against free radicals, which can disturb fetal development and even lead to cancers. Vitamin C can also lower the risk of premature birth (6). The vitamin A, abundantly found in mangoes, helps in the formation of baby’s teeth and bones. It is also essential for eye and immune system development and aids in the development of heart, lungs, and kidneys (7). Mango is also a source of vitamin B6, which plays a role in the development of the fetal brain and nervous system (8). 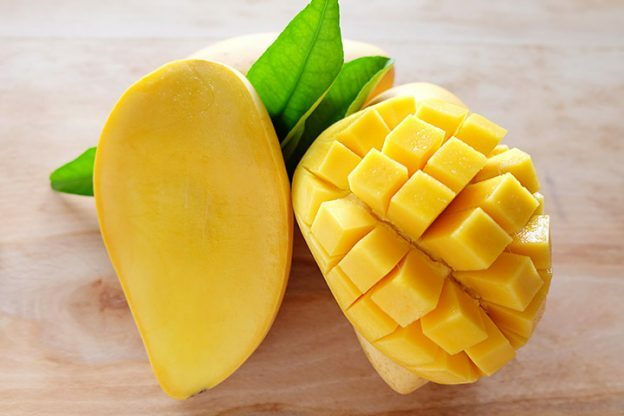 Magnesium, present in reasonable amounts in mango, acts as an excellent natural remedy for preeclampsia while the vitamin E in this fruit helps build fetal muscle and prevents preeclampsia (9) (10). The fresh taste of mango helps prevent morning sickness. Vitamin B6 in this fruit also plays a key role in relieving you from nausea and morning sickness (11). 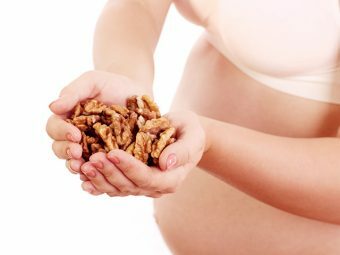 As the blood volume increases during pregnancy, your body needs extra minerals. Mangoes contain electrolytes such as potassium, calcium, magnesium, and sodium that help in maintaining the fluid balance (12). Electrolytes ensure that your nerves, heart, brain and the muscles work as they should. Although mango offers numerous benefits, you need to be mindful of eating it while pregnant. Diarrhea: Over consumption of mangoes can cause diarrhea, which can lead to dehydration (13). Dehydration during pregnancy is common and can be dealt with by keeping the diet in check. Increased risk of gestational diabetes: Mango has high levels of sugars and can put you at a greater risk of diabetes mellitus. Eating fewer mangoes, which have a medium Glycemic Index (GI), can help overcome the risk of gestational diabetes (14). Excess weight gain: Mangoes are rich in carbohydrates and add to your already increasing pregnancy weight. Allergic reactions: Some people can have an allergic reaction when they come in contact with the fruit skin or the sap. If you experience the ‘mango itch’, avoid the fruit (15). Reactions from artificially ripened mangoes: Mangoes that have been artificially ripened can have an adverse effect on both the mother and the baby. These fruits are ripened using calcium carbide, a toxic substance that contains traces of arsenic and phosphorus. Consumption of these mangoes could lead to mood swings, sleepiness, headaches, dizziness, confusion, seizures, mouth ulcers and tingling in hands and feet (16). So only choose mangoes that have been naturally ripened. It is not always easy to buy naturally ripened fruits. However, you can take measures to minimize the toxins you ingest by eating a mango that is not organic. Wash the fruit thoroughly: Washing the fruit before consumption helps get rid of any chemical residues. It also removes any contamination by the listeria bacteria from the soil. Peel the fruit: Do not eat the skin. Peeling the mango skin after washing will also reduce toxin exposure. Maintain hygiene: Always clean the knives and chopping board before use, and wash your hands after getting in contact with the mangoes. Ripen the fruit at home: To keep toxins away, buy raw mangoes and ripen at home naturally. That eliminates the risk of calcium carbide contamination. Which Mangoes Are Safe During Pregnancy – Ripe Or Raw? Consuming ripe and raw mangoes during pregnancy is safe, provided you take them with caution. Ripe fruit offers natural sugars and is an excellent replacement for high-calorie desserts. Ripened mangoes stimulate appetite, aid digestion and improve your complexion. The raw fruit is rich in vitamins and antioxidants, which help fight morning sickness and acidity, improve immunity, and keep the liver healthy. You can continue to eat mangoes during your final trimester but in smaller quantities. Excessive intake around this time can cause gestational diabetes. Also, avoid mangoes during the final weeks of pregnancy if you had experienced any allergic reactions earlier. To enjoy mangoes in moderation, consider this recipe. This mango and spinach smoothie offers beta-carotene, essential minerals, and fiber. It helps you relax and also cools your tummy. Blend them until you get a smooth mixture. Keep reading if you have any more doubts about consuming mangoes during pregnancy. 1. Can mango abort the pregnancy? Excess intake of raw mango, which is one of the fruits that most pregnant women crave, is considered to increase heat in the body (17). It can trigger bleeding, especially in the third trimester, and thus lead to miscarriage. 2. Can I drink mango shake or juice during pregnancy? Yes, you can have mango milkshake or juice without any restrictions. 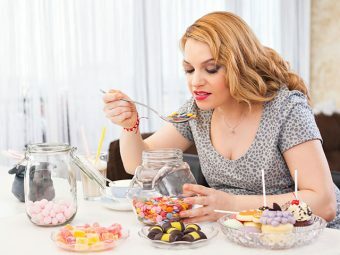 But note that they are high in sugars and calories and should be taken in moderation. 3. Can I eat mango pickle during pregnancy? You can consider eating mango pickle, but only occasionally. 4. Can I eat dry mango powder during pregnancy? Yes, you can have dried mango powder (Amchur) as it is high in iron. It also prevents acidity and improves skin tone. As long as they are taken in moderation, mangoes are not bad for you during your pregnancy. To stay safe, check with the doctor or a nutritionist on the best ways to eat this fruit. After all, the yellow and green fruit is a treat to the taste buds and must not be missed when in season. Have any yummy mango based recipes to share with our readers? Tell us about them in the comments section. Is It Safe To Eat Oranges In Pregnancy? Is Mangosteen Safe During Pregnancy? Is It Safe To Drink Coke During Pregnancy? 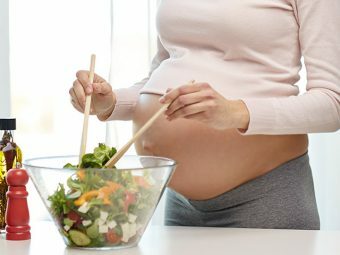 Is It Safe To Eat Caesar Salad During Pregnancy?